Giants C Prospect Andrew Susac led the AFL in OBP after a decent year in AA. Does he deserve a bump up in SF’s prospect rankings? With his team’s season now over in the AFL, Giants catching prospect Andrew Susac has wrapped up another long year. He has played in a hundred games for the second straight season, all as a catcher to the best of my knowledge. 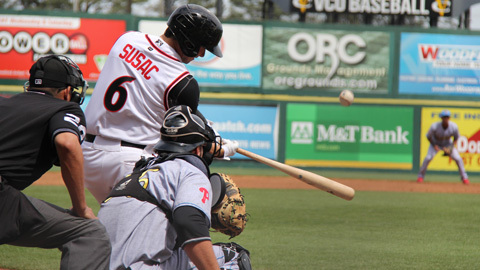 Susac was drafted in 2011 in the second round by the Giants out of Oregon State and has quietly been very good in the Giants organization. He finished his second pro season in AA, with a tour of the AFL at the end of an 84 game stint for the Flying Squirrels in the Eastern League. Susac rounded off his season by posting one of the better offensive lines in the Arizona Fall League with a .360/.507/.480 line. I’m always drawn to outlier performances and one of my favorites are players with higher OBPs than SLGs, and with a startlingly unsustainable .507 OBP, I couldn’t ignore Susac any longer. Carson Cistulli of Fangraphs regresses prospects’ performance in various minor leagues to their expected walk and strikeout rates based on their peripheral stats, like an FIP for hitters, and ranked Susac the fourth best hitter in the AFL this year. Does he profile as a future major leaguer? The gist of it is probably. Does he profile as a replacement for the perennial All-Star and Golden Man currently playing his position at the highest level? Not exactly.